Sirupate 15" long blade for more longer reach is more like a machete clearing things shorter kukris can not reach. This Siru is crafted in such a special way that is has 3 Chiras. 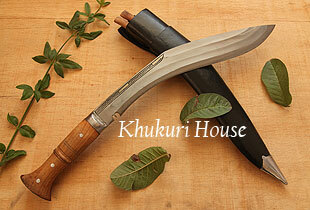 This Sirupate Khukuri blade mostly made for villagers with a slimmer longer blade is for longer reaches where shorter blades can not reach its target. Very popular while in deeper forest and out in the field or even like a weapon. This Siru Khukri blade is crafted in a unique way which was never done by this House. The blade is given 3 Chiras or layers which is the first for this blade. KH is proud to pull it off.